What's the future of an independent AOL? Independent of Time Warner as of Wednesday, AOL will look to advertising, blogs as a new business model. Tech editor sees AOL becoming a behind-the-scenes "holding company"
(CNN) -- It was a mammoth deal that, in the heady days of the dotcom boom, seemed like a perfect union. AOL, the Web portal for millions and arguably the most iconic name of the Internet age, would join with Time Warner, one of the world's largest media and entertainment conglomerates. In the end, it turned out to be what some sober-minded analysts have called the worst business deal in history. On Wednesday, the uneasy marriage was to end. That's when AOL's spin-off from Time Warner -- also the parent company of CNN -- was to become official. But on an Internet vastly bigger and more diverse than when the Time Warner deal went down in early 2000, what does the future hold for the once-dominant online hangout? No one is predicting a return to the company's heyday in the 1990s, when its blue triangle logo was everywhere and its chirpy "You've Got Mail" greeting inspired the title of a hit Tom Hanks-Meg Ryan romantic comedy. But some observers say there's a chance for success as a smaller and less highly visible Web player. "What happens to AOL after the spinoff will be one of the most interesting things to watch next year, I imagine," said MG Siegler, a technology and new-media writer for the online TechCrunch network. "Not only is the company rebranding itself, but it appears to be attempting to shift its entire focus to become more of a content publisher. "Its role as an ISP [Internet service provider], once its core, is all but dead now." While saying they still plan to offer their best services to a dwindling base of paying subscribers -- down from more than 26 million in 2002 to about 6 million today -- AOL's leaders say they're ready for the shift. "In terms of the vision for where we're headed, it's dramatically different than where AOL has been in the past," said Jeff Levick, AOL's president for global advertising and strategy. The new model, he said, is focused on three areas -- publishing blogs, news and other online offerings; advertising; and refocusing on communications tools such as e-mail and its AIM instant-messenger service as ways to distribute its original content. Of the three, advertising is the area where Levick sounds the most bullish. With Google the clear search-engine leader and sites like Facebook and Twitter strengthening their stranglehold on the social-media market, AOL sees advertising as a level playing field. "That's where we'll really double down -- making advertising one of the core platforms and business opportunities for the company," he said. "We see this as very much of a growth category. There isn't an incumbent or one clear winner in this space." Observers note that while many Internet users know AOL only as the e-mail account they had in the late 1990s or early 2000s, the company has other properties that aren't typically associated with its brand. AOL-owned Mapquest has lost some business to Google Maps, but still has tens of millions of users every month. Weblogs Inc., bought by AOL in 2005, hosts more than 75 blogs, including tech site Engadget and TV Squad, one of the Internet's most popular television blogs. Its Advertising.com, purchased in 2004, already is at the top of Internet display advertising. And despite declines, AOL's main page remains one of the most-visited sites on the Internet. In October it remained fourth -- ahead of Facebook and behind only Google, Yahoo and Microsoft -- with 98.5 million unique users, according to comScore, which measures popularity within the digital world. It is fairly insane that in 10 years AOL has gone from the Goliath . . . to a shadow of an Internet brand. The page itself is a nod to AOL's new direction, embracing an online world far from the insular experience it once offered its paying customers. Instead of finding a one-stop shop, AOL users can now log in to their Facebook, MySpace or Twitter accounts directly from the site. Amazon, eBay -- even Gmail and Yahoo -- also have links on the page. Business experts see potential for a successful shift -- if AOL is able to ride out a rough patch that in November saw the company announce plans to downsize its work force by one-third. "They need to retain their dial-up subscribers for as long as possible, because those are free revenue," said David Joyce, a media industry analyst with trading firm Miller Tabak + Co. "There's clearly still some audience for that." Joyce said, however, that AOL has continued to lose between 400,000-500,000 of those subscribers every quarter and the key to its success will be finding new ways to drive traffic to the properties under the AOL umbrella. "That's the overarching strategy that they have to employ," he said. "It's been a several-year strategy shift that still has to show results." Time Warner's stock plummeted after the merger -- from more than $99 on January 10, 2001, to about $30 on Tuesday. The new AOL's market value, when it rolls out its own stock, has been estimated by several analysts to be up to about $4 billion. Adam Ostrow, editor of online news blog Mashable, predicted a future in which AOL's holdings won't be thought of as AOL holdings at all. "Ultimately, as a brand name, AOL won't be important," he said, citing properties like Engadget that already don't flaunt the affiliation. "It could become a sort of holding company where people really don't think about the name -- a media business where they're almost a faceless conglomerate that owns a bunch of stuff." Levick wouldn't go that far, but acknowledged that having the company's name on its products won't always be important. "The brand will reveal itself where it makes sense and brings life to the content," he said. "Consumers don't engage with great brands -- they engage with great products and great content." The company's desire to be viewed in a new light is clear visually in its rebranding, which will be fully rolled out on Thursday. The name will become "Aol." -- the second two letters lowercase and with a period at the end. Gone will be the blue triangle, replaced by simple white lettering that appears on constantly changing backgrounds. 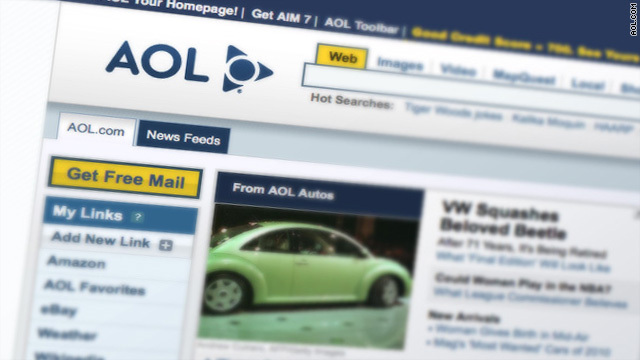 "This is a turnaround -- it's a new day for AOL," said company spokeswoman Tricia Primrose. "There's a lot of work to be done, but we see tremendous opportunity in the areas we're going to be competing in." Siegler called the spinoff a fascinating chapter in one of the Internet age's most intriguing stories. "It is fairly insane that in 10 years AOL has gone from the Goliath that actually purchased Time Warner to a shadow of an Internet brand," he said. "But they have solid people in place now like [chairman and CEO Tim] Armstrong and [new communications president] Brad Garlinghouse who are both well-respected and have a track record of making things happen. "It's an uphill battle, but we'll all be watching it," Siegler said. "Everyone loves a comeback story."